There is 3 months left until summer guys, which means it's time for me to stop with the chocolate croissants and start drinking lemon water. Before we get into this, I'm not trying to preach that you have to go join a gym to get in shape just because summer is around the corner, but since I have noticed a sudden influx of people at my gym, I've gathered that this is the general motivation for people at the moment. The idea should be that you're working on your fitness all year round so that you don't have to go on a crash diet/fitness plan on the months leading up to summer - but with Easter coming up, I myself will probably be back to square 1 come April because I love 'bollos de hornazo'. Any who, these are some of my tips for staying motivated for the gym and making every workout count. Saying you're going to join the gym or try and go 4 times a week is already a start. If you tell yourself you'll just go 'when you have time' or 'can be bothered' chances are your membership card will be wasting away in your purse or like me in 2016, swapped for an Odeon Limitless card. Make it a point of saying you are going to do this long-term and succeed. 2. Have a workout plan/schedule. Once you're committed, it's probably best to know what you're actually going to be doing once you're there. If you know you're going to be out on Friday night, don't plan to go do a HIIT cardio session at 10am the next day. For me, I aIm for Monday-Thursday and then try and go on a Sunday because it's nice and quiet and I can actually get to the weight machines without a man staring me down to move. There are many different ways you can do this depending on your goals - whether it's weight loss, muscle gain or changing your body composition. For weight loss the obvious route is to weigh yourself, which will work at first but when you start building muscle you may find the number won't shift or you might be going up on the scale. So instead it's worth looking at your body fat % or using a measuring tape to see changes that a scale can't see. Progress photos are also great because you can see where it is you're building/losing. When I embarked on my fitness journey last June, I thought I'd be able to lose 1kg per week and be at my ideal size by August. Turns out I like food too much but luckily all the dancing at summer events helped me out a bit. Unless you're trying to lose a small amount of weight for an event or are extremely regimented then you need to leave room to enjoy life - I don't believe in sacrificing birthday cake, nights out or cheesy garlic bread because I'm not training for anything and the gym is not my life, it's just a nice side hobby. Me and my mum go to the same gym, so the only thing that motivates me to go in the evenings is the fact we go together - even if we do our separate thing once we get there. This can go both ways, because when me and another friend go we spend more time chatting than lifting. If you have a friend who goes often or is particularly motivating, they might push you to do the same! 6. Know what works for you. I remember when I first started I dreaded going because walking on the treadmill for half an hour is soooo boring. Now I start every workout with a 10 minute HIIT workout on the cross-trainer and end with 15 minutes on the treadmill whilst watching a Ted Talk, and it's actually enjoyable. I tried a HIIT class but found I hate jumping up and down, whereas other people love the atmosphere. After rowing when I was younger/first year of uni I also grew to hate the rowing machine so I stay far away from that. 7. Create a heart pumping playlist. To make the time go faster when on the CT I usually watch old RnB music videos or anything on my pre drinks playlist so I can day dream about being out instead. When it comes to weights - Kendrick Lamar, Eminem, Imagine Dragons and 'I'll Make a Man Out of You' all get me pumped. I find that if I watch something that has a good music video it keeps me distracted and makes the time go by faster. Going to the gym 5 times a week is pretty pointless if you're going to be having a Burger King four times a week (if only). There are days that I train so that I can eat cheesecake, and there are days I train because I want abs and want to eat 'clean' all day. Depending on what your goals are the food you eat will have 70-80% of the impact on your results. This doesn't mean restricting your diet to under 1000 calories or having a salad every night, but using an app like MyFitnessPal is great for tracking what macronutrients you are taking in (fat/carbs/protein) and can be adjusted depending on what you're looking for. More importantly, what you eat before and after should be fuelling your workout and there are loads of articles on this. As a general rule, you should be getting your calories from 40% protein, 35% carbs, 25% fat if you're looking to shift fat and gain muscle - but again this is specific to your goals and your needs. Something like IIFYM is a good calculator that can work this out for you. I'm not saying you have to post a Facebook update every time you eat a salad or a belfie every time you're in the gym - but posting about your progress might keep you on track or words of encouragement may keep you motivated to carry on. If you don't want to share your goals with a large audience, even telling a friend or your family what you want to achieve works just as well. 10. Wear what you're comfortable in. It's always a good sign when your gym clothes start falling off, but nobody likes running on the treadmill and having to pull up their leggings every 20 seconds! I feel like when I'm digging my gym clothes I feel more positive overall, and you don't have to spend £100 to get there. 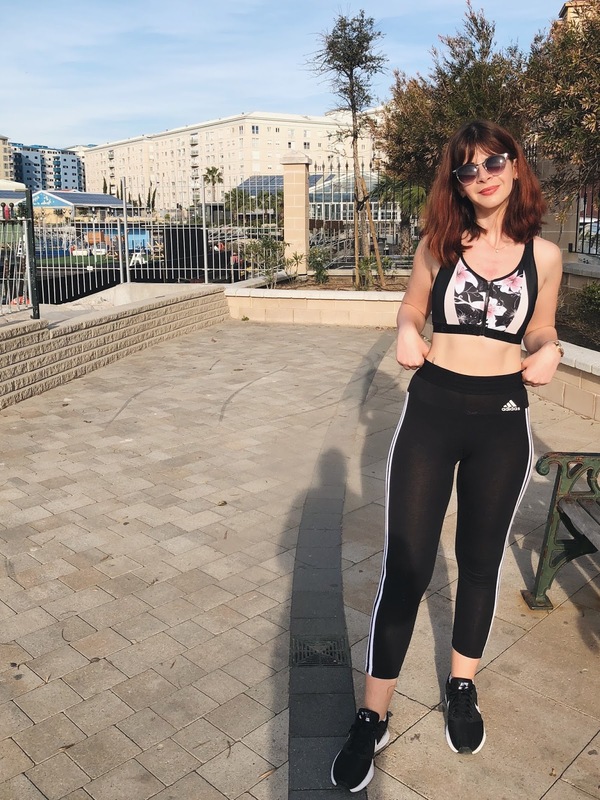 Whether you like loose t-shirts, floral crop-tops or tracksuit bottoms, do your thing. I've been bloated for what feels like a month, so I was braving this outfit but it's such a beautiful sports bra I couldn't resist. P.S the red patch I didn't 'fix' on the photos is a result of me scratching and not from the bra itself! Since this post is not sponsored by adidas, I can also point out that yes, they are not squat proof or walking proof for that matter. 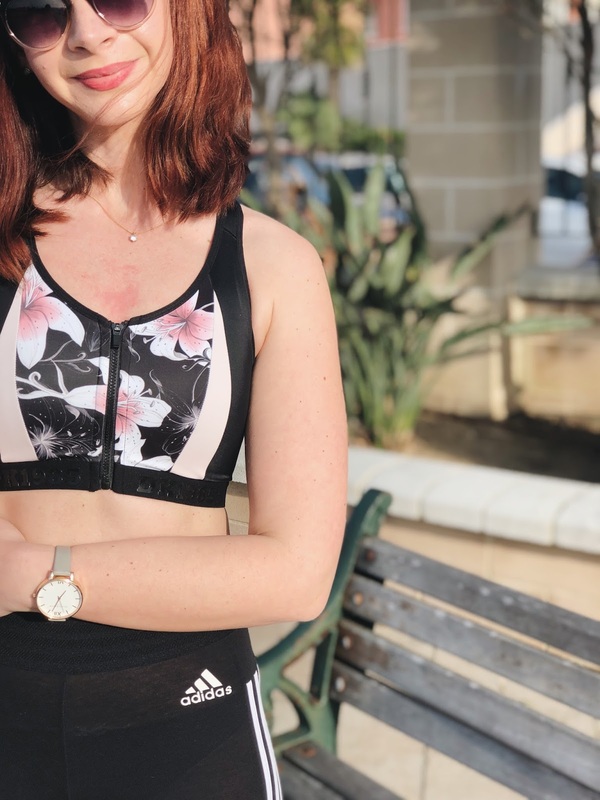 On the other hand, Hunkemoller* is a clothing brand based in The Netherlands that specialises in lingerie and undergarments - and pretty sports bras! I don't have much in that department so I don't need bras with high support, but for someone who does it's perfect because it keeps everything in place with it's handy zip function. I love the thick straps as they stay in place and don't fall off your shoulders as you're moving about. So whether it's yoga, running or boxing you fancy it's a sports bra that stays in place, probably better than my regular bras do! What motivates you to stay fit? Do you prefer going to traditional gyms or do you prefer other outdoor activities? That Hunkemoller sports bra is stunning! It’s so true I need to sit down and set myself some realistic goals. I’ve been eating fairly clean for a while now, trying to only have carbs for dinner so just need to get my exercise regime into gear, cause I really want to shift some pounds. I’ll definitely measure myself though, so I can see how my body is changing more accurately! Such a great post, G! I don’t go to the gym, and I (surprise) wasn’t in one in my whole life. I really like doing yoga, and wearing leggings and fitting bras/shirts/etc is essential! I should be checking out Hunkemoller, it really sounds amazing! I have to do the craziest moves, and I hate those lose shirts, which always tend to fall off by themselves! Love the sports gear that you are wearing!! I have been cutting down on foods and going to the gym (not as regularly as I should) and didn't realise just how much diet can have an effect on you! I seem to go through phases of being really motivated but I go on my own so sometimes when I get home from work and I'm tired I just can't make myself get up and go out! I love the look of Hunkemoller sports bras! I knew that they specialised in lingerie but I didn't know that they had sportswear too so I need to go and investigate their site! I don't have much in the boobage department either so pretty sports bras are thankfully an option for me, I'm always more motivated to work out when I have something to wear that I feel great in! I definitely agree about the impact that tracking your progress has on motivation, it's such a good feeling to see the times of my runs going down! Fab post as always! The Sportbra is so pretty, the colours just work so well! I haven’t heard of this brand but I may have to check it out!! I like the idea of keeping track of what nutrients I'm getting and how much protein and things like that, but I can't handle that My Fitness Pal app! I just find tracking things to that extend drives me crazy. I love love love that sports bra! You look hella good in it.